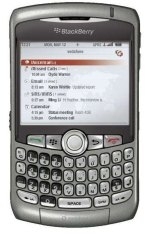 BlackBerry Curve in Red for AT&T | BlackBerry Blast! It has been common over recent years for cell phone makers including RIM, to offer their phones in multiple colors. We've seen T-mobile recently offer the BlackBerry Pearl in multiple colors. Now comes word from an anonymous tipster that AT&T will offer a BlackBerry Curve 8310 in Red. engadget mobile got the tip so we have faith that it's a fairly reliable rumor.